I'm am twenty one, live in Poland and I've used to appear in the internet as Metka since I could remember. I started playing Petz when I was about nine. 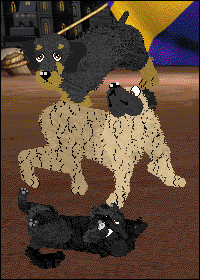 Some time later I found virtual petz society and became a more "professional" breeder. I had a lot of kennels with many breeds, for example labrador retriever, tatra shepherd dog, english cocker spaniel and border collie. The one I enjoyed the most was wirehaired dachshund I really like to work with - so they're still with me. Earlier I had a separate kennel for them, but now they're just part of Metiette - though prefix for them stayed "Findarato", as it was. In my real life, I study psychology and teach English. I'm also a big fan of nail polish and makeup - and I definitely have hoarding tendecies, since my drawers can barely contain my collection.